Nine boxes of three type – Plastic (B11, B21 and B13), Wooden (B12, B31 and B01) and Metal (B22, B10 and B14) are kept one above other in the form of stack. Each box is wrapped with different colored paper – Black, Blue, Pink, Yellow, Green, Cyan, Brown, Red and White. Each box also contains different fruits viz. Lemon, Berry, Mango, Fig, Papaya, Guava, Banana, Cheery and Grapes. Each box is marked with different number either a perfect square or perfect cube number between 2 – 200. Boxes are marked and placed in such a way that either kept in ascending or descending order of numbers from top to bottom. All the given information is not necessary in same order. No two boxes of same type are kept together. The box wrapped with White paper is marked with cube number and is kept at a gap of one box below B31. No box is marked as 9. The box wrapped with Black paper is marked with cube number. Box B11 is kept just above the box having Grapes. B22 is kept at a gap of two boxes from the box marked 81, which is kept just above the box wrapped with Cyan paper. Box B31 having Guava is kept just below Metal box marked 121. At most two boxes are kept below the box wrapped with Green paper. 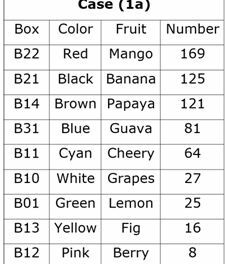 At most four boxes are kept between the box having Banana and the box B01, which doesn’t contain Papaya. The box wrapped in Brown paper is neither is neither kept adjacent to box marked 64 nor adjacent to box having Grapes. The box wrapped with Green paper is kept at a gap of two boxes from the box having Guava. Three boxes are kept between the box wrapped with Pink and the box marked 64. No metal box contains Banana. The box having Fig is kept just below the box wrapped with Green Paper. One box is kept between the box wrapped Brown and box B22, which is neither marked 121 nor wrapped with White paper. The box wrapped with Pink neither contains Fig nor contains Mango. One box is kept between box B13 and box B10. The box having Mango is kept at a gap of three boxes above box B11, which neither contains Fig nor wrapped with White paper. The box wrapped with Red paper is marked as 169. Three boxes are kept between the box wrapped with Blue paper and plastic box, which is kept adjacent to the box marked 8. Two boxes are kept between the box having Cheery and the box B21, which is not kept at bottom. The box having Berry and the box wrapped with Yellow paper are kept together. Lemon is kept at one of the position below Box containing Banana. B01 does not contain Berry or Papaya. 1. Which of the following statement is true with respect to the box having Papaya? At most two boxes are kept below the box wrapped with Green paper. The box having Fig is kept just below the box wrapped with Green Paper, that means we have two possible place for the box wrapped with Green paper, in case (1) the box wrapped with Green paper is kept third from bottom, in case (2) the box wrapped with Green paper is kept second from bottom. The box wrapped with Green paper is kept at a gap of two boxes from the box having Guava. Box B31 having Guava is kept just below Metal box marked 121. Since, only seventeen possible square and cube number between 2-200 i.e. – 4, 8, 9, 16, 25, 27, 36, 49, 64, 81, 100, 121, 125, 144, 169 & 196. As, only four possible numbers greater than 121, thus boxes are kept in descending order from top to bottom. The box wrapped with White paper is marked with cube number and is kept at a gap of one box below B31, since boxes are kept in descending order, thus box wrapped white must be kept below box B31 and only two possible cube number is possible out of 8, 27 & 64, that means in case (1a)& case (2a)box wrapped white is marked as 27, in case (1b) & case (2b) Box wrapped White is marked 64. Box having Mango is kept at a gap of three boxes above box B11, which neither contains Fig nor wrapped with White paper. 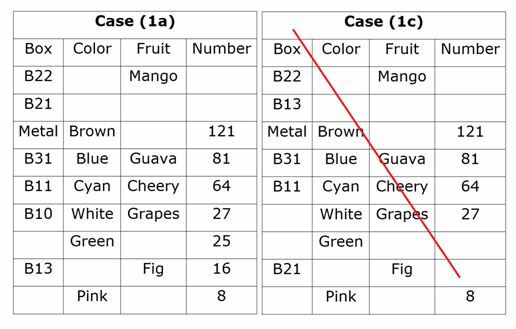 Box B11 is kept just above the box having Grapes, since box B11 is from plastic category, thus box B11 is kept just below box B31. Three boxes are kept between the box wrapped with Pink and the box marked 64. The box marked Pink is neither contains Fig nor contains Mango, that means in case (1a) the box marked Pink is kept at bottom, in case (2a) the box marked Pink is kept at top, in case (1b) & case (2b) the box wrapped with Pink paper is kept just below the box having Mango. One box is kept between box wrapped Brown and box B22, which is neither marked 121 nor wrapped with White paper. The box wrapped in Brown paper is neither is neither kept adjacent to box marked 64 nor adjacent to box having Grapes. Box B22 is kept at a gap of two boxes from the box marked 81, which is kept just above the box wrapped with Cyan paper, that means in case (1a) Box B22 contains Mango, and case (1b), case (2a) & case (2b) are not valid. Case (2a) is not valid as no box available to mark 81, case (1b) & case (2b) are not valid as between 64 and 81 no any number is possible which is either perfect cube or perfect square. Two boxes are kept between the box having Cheery and the box B21, which is not kept at bottom, since no two boxes of same type is kept together, that means in case (1a) Box B21 is kept second from top and box B11 contains Cheery, in case (1c) Box B21 is kept second from bottom and box B11 contains Cheery. Three boxes are kept between the box wrapped with Blue paper and plastic box, which is kept adjacent to the box marked 8, that means in case (1a) box B31 is wrapped with Blue paper and pink box is marked 8, in case (1c) box B21 is wrapped with Blue paper and pink box is marked 8. One box is kept between box B13 and box B10, that means in case (1a) Box B10 is wrapped with white paper and case (1c) is not valid. No box is marked as 9, that means box B13 must be marked as 16 and box having Lemon is marked as 25. Case (1c) is not valid as one box is kept between box B13 and box B10. Box wrapped with Black paper is marked with cube number, since only remaining possible cube number between 2-200 is 125, thus B21 must be wrapped with Black color. Box wrapped with Red paper is marked as 169, thus B22 is wrapped with Red paper. Box having Berry and the box wrapped with Yellow paper are kept together, that means B13 wrapped with Yellow paper. 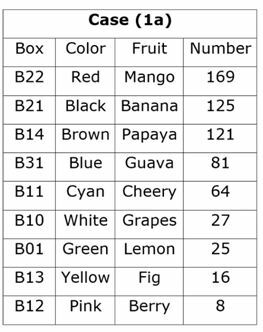 At most four boxes are kept between the box having Banana and the box B01, which doesn’t contain Papaya. No metal box contains Banana, that means box B21 must having Banana and B01 Wrapped with Green paper and contains Lemon. Lemon is kept at one of the position below Box containing Banana. B01 does not contain Berry or Papaya. Clearly, only statement B is true. Clearly, combination C is correct combination. 3. What is the square root of the difference of numbers on box B14 and the box which contains Guava? 4. Which of the following combination is true for wooden boxes? Clearly, none of the combination is true. 5. Which of the following box is wrapped with Black paper? Clearly, box B21 is wrapped with Black paper. (Directions 6–8): In each question there is a set of statements followed by four conclusions numbered I to IV. You have to take the given statement to be true even if they seem to be variance with commonly known facts. Read all the statements and conclusion carefully and then decide which of the conclusion follows logically. ‘P@Q’ means “All P are Q”. ‘P#Q’ means “Some P are Q”. ‘P&Q’ means “Some P are not Q”. ‘P%Q’ means “No P is Q”. ‘P^Q’ means “All P can never be Q”. ‘P$Q’ means “All P can be Q”. Crow # Pigeon % Duck @ Owl; Crow @ Hen % Eagle; Kite # Duck. From conclusion I: Some Pigeon are not Eagle. Clearly, no Hen is Eagle and some Pigeon are Hen, thus “Some Pigeon are not Eagle” is true. From conclusion II: All Hen can never be Duck. Clearly, no duck is Pigeon and some Hen are Pigeon, thus “All Hen can never be Duck” is true. From conclusion III: Some Owl are not Hen. 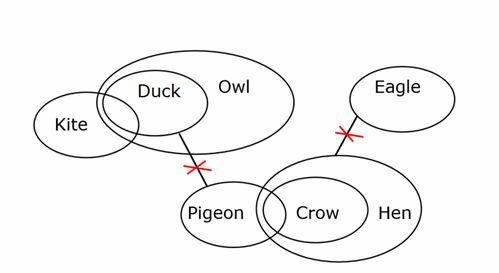 Clearly, there is no direct connection between Owl and Hen, thus “Some Owl are not Hen” is not true. Hence, conclusion III doesn’t follow. From conclusion IV: All Pigeon can be Kite. Clearly, there is no direct connection between Pigeon and Kite, thus “All Pigeon can be Kite” is true. From conclusion I: All Red can be Green. Clearly, no Yellow is Green & some Yellow are Red, thus “All Red can be Green” is not true. Hence, conclusion I doesn’t follow. From conclusion II: Some Yellow are not Brown. 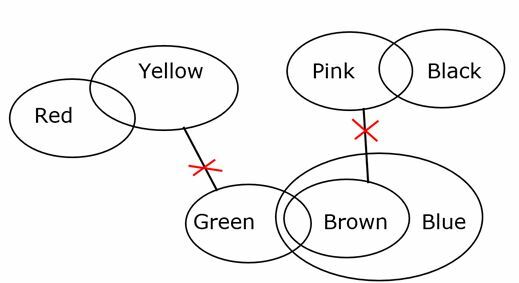 Clearly, there is no direct connection between Yellow and Brown, thus “Some Yellow are not Brown” is not true. Hence, conclusion II doesn’t follow. From conclusion III: All Red are Brown. Clearly, Some Red are not Green, thus “All Red are Brown” is not true. Hence, conclusion III doesn’t follows. From conclusion IV: Some Black are not Brown. Clearly, no Brown is Pink & some Pink are Black, thus “Some Black are not Brown” is true. 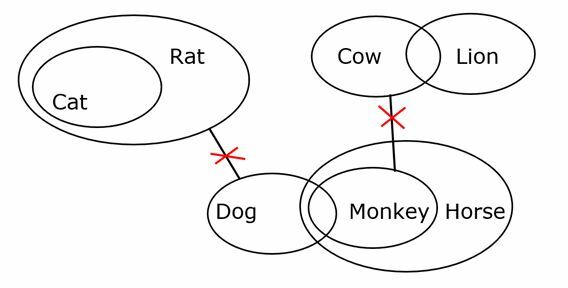 Given statement: Cat @ Rat % Dog # Monkey @ Horse; Lion # Cow % Monkey. From conclusion I: Some Lion are not Monkey. Clearly, Some Lion are Cow and No Cow is Monkey, thus “Some Lion are not Monkey” is true. From conclusion II: All Lion can never be Dog. Clearly, there is no direct connection between Lion and Dog, thus we can’t say “All Lion can never be Dog”. From conclusion III: Some Horse are not Rat. Clearly, No Rat is Dog and some Horse are Dog, thus “Some Horse are not Rat” is true. From conclusion IV: Some Cow are not Horse. Clearly, there is no direct connection between cow and Horse, thus “Some Cow are not Horse” is not true. Hence, conclusion IV doesn’t follow. (Directions 9-10): In each question there is a set of statements followed by three conclusions numbered I to III. You have to take the given statement to be true even if they seem to be variance with commonly known facts. Read all the given statements and conclusions carefully and then decide which of the conclusion follows logically. ‘P@Q’ means “Some P are Q”. ‘P%Q’ means “All P are Q”. ‘P^Q’ means “No P is Q”. ‘P#Q’ means “All P can never be Q”. Given statement: Rose @ Mango ^ Lilly % Banana; Litchi ^ Banana @ Papaya. From conclusion I: All Banana can never be Rose. Clearly, there is no direct connection between Banana and Rose, thus “All Banana can be Rose”. 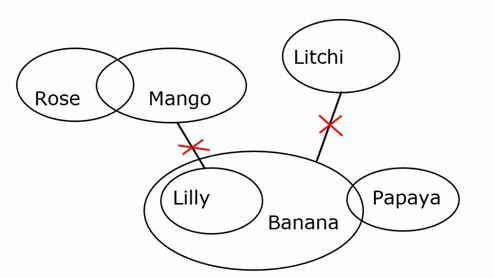 From conclusion II: Some Papaya are not Litchi. Clearly, no Banana is Litchi and some Banana are Papaya, thus “Some Papaya are not Litchi” is true. From conclusion III: All Litchi can never be Papaya. Clearly, there is no direct connection between Litchi and Papaya, thus “All Litchi can never be Papaya” is not true. Given statement: Pen ^ Book @ Copy ^ Marker % Pencil; Pen % Eraser @ Mobile. From conclusion I: Some Eraser are not Book. Clearly, no Book is Pen & all Pen are Eraser, thus “Some Eraser are not Book” is true. From conclusion II: All Mobile can never be Copy. Clearly, there is no direct connection between Mobile and Copy, thus “All Mobile can never be Copy” is not true. From conclusion III: Some Pencil are not Copy. 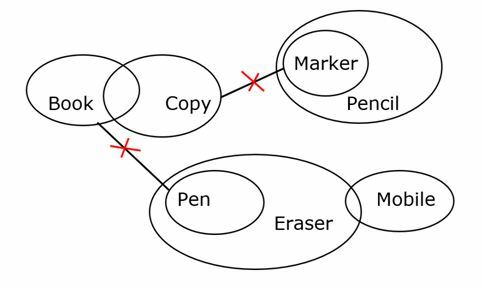 Clearly, no copy is Marker and all Marker are Pencil, thus “Some Pencil are not Copy” is true. 1) Which of the following statement is true with respect to the box having Papaya? a) The box having Banana is kept just below the box having Papaya. b) One box is kept between the box having Papaya and the box wrapped with Cyan paper. c) Only four boxes are kept below the box having Papaya. d) Two boxes are kept between the box contains Papaya and the box having Lemon. e) More than two statements are true. 3) What is the square root of the difference of numbers on box B14 and the box which contains Guava? 4) Which of the following combination is true for wooden boxes? 5) Which of the following box is wrapped with Black paper?